The Sony XF9005 improves upon last year's model in many areas: brightness, colour, HD upscaling and motion clarity all get a bosst. Problem is, so does the backlight blooming as a result of that extra brightness. Otherwise - ignoring the big feet of the design - this is one stellar back-lit LCD telly. Sony struck TV gold in 2017 with its XE90. Fitting this affordable mid-range TV range with a contrast-enhancing direct LED lighting system (where the lights are placed right behind the screen) rather than the much more common edge-lighting approach made them a hit with TV reviewers and consumers alike. Sony is predictably keen to repeat this success in 2018, and so has pulled out a surprising number of stops to ensure that the XE9005 range's successors - as represented here by the 65-inch XF9005 model - outgun their predecessors in just about every way. Does the Japanese giant suceed? And how does the Sony KD-65XF9005 fare in the world of super-bright Samsung QLED? While it's not ugly, the XF9005 does have a bit of a foot issue. Its desktop supports are so comically big and protrude from each side of the TV at such a pronounced angle that they're kind of all you see when you first look at the set. Especially when the dark, matte, lightly textured frame around the main screen seems to be trying so hard to draw minimal attention to itself. The positioning of the feet under each bottom corner of the screen also means you'll need to stand the TV on a fairly wide bit of furniture. Or hang it on your wall, of course. The big feet do harbour one redeeming feature: channelling into which you can tuck all your cabling. The XF9005's connections include four HDMI, three USB ports, and both wired and wireless network options to support its smart features and streaming from networked DLNA-capable devices. In keeping with all of Sony's mid-range and high-end TVs, the XF9005 uses Google's Android TV platform to deliver the majority of its smart features. Which is a pity, frankly, given that Android TV continues to be among our least favourite of the smart TV platforms available. Its home screen feels clumsy and poorly organised, for instance, as well as allowing only a tiny amount of customisation compared with the best rival systems. It makes precious little effort to learn your viewing habits and make sensible recommendations accordingly. Instead, it generally just pushes content that various content providers want it to push. It's worth adding, too, that Android TV is painfully prone to often quite large software updates - and also tends to crash more than any rival smart system. Fortunately, Sony has at least helped out when it comes to the UK's catch-up TV services by integrating the YouView app and more. This platform provides access to content from the BBC, ITV, Channel 4 and Channel 5 platforms. The headline attraction of the XF9005 is its use of direct LED lighting and local dimming. In other words, it places its LED lights right behind the screen, and can continually have different sections of those lights output different levels of light to their neighbours, to suit the content of the pictures you're watching. Experience has shown time and again that this approach delivers much better contrast from LCD TVs than the more common edge-lighting approach. This is the main reason why 2017's XE9005 sets did so well, and Sony claims to have taken this a step further for the XF9005 by slightly increasing the amount of individually controllable dimming zones the screen carries. That's just the start of the improvements, though. Another is the step up from the standard Sony X1 chipset of the XE9005 to Sony's much more powerful X1 Extreme processor. This introduces superior HD-to-4K upscaling courtesy of a dual library system for more efficient detection and reduction of source noise, and more accurate calculation of all those extra pixels that need to be added to HD to make it 4K. There's also Super Bit Mapping to remove potential colour banding noise from HDR (high dynamic range) pictures, plus Sony's Triluminos colour system and its wide colour gamut panel with more powerful colour processing. perhaps most importantly of all, the X1 Extreme chip is powerful enough to support the premium Dolby Vision HDR format. This provides a TV with extra scene by scene information to make picture quality better. In the case of the XF9005 that DV update is not here just yet, but it's coming later down the line. Bear in mind, though, that the way the Sony Dolby Vision system works means it will only work with the TV's internal, Dolby Vision-capable apps, plus external Dolby Vision sources that have also received their own Sony-specific update. At the time of writing, the only external Dolby Vision source to have received this update in the UK is the Apple TV 4K. It's expected, though, that all Dolby Vision-capable 4K Blu-ray players will follow suit at some point. Sony has substantially increased the 65XF9005's brightness versus its predecessor too. Its peak HDR output measured at around 1000 nits - an increase of 25 per cent over that of the XE9005 range. Gven the main complaint raised against the mostly excellent XE9005 range was that a lack of brightness to do HDR full justice, this boost for the XF model makes an obvious difference. More impressive is how the XF9005's black levels look slightly more profound than those of the XE9005 too. HDR sources look much more dynamic in the newer telly thanks to the XF9005's ability to reach far brighter peak brightness levels without compromising on the impressive black level depths that made its predecessor such a mid-range hit. Then there's the XF9005's colour performance. Relatively affordable HDR TVs often struggle to retain the rich saturations associated with wide colour gamut sources such as 4K Blu-rays, tending to leave them looking low on detail or slightly bleached out. But the XF9005's combination of lots of brightness for its price point, good black level response, and Sony's Triluminos system means that colours contain far more colour volume than any similarly priced TV. They also deliver the brightest tones without suffering the sort of fading issues that can affect OLED TVs (due to their use of white sub-pixels) and edge-lit TVs (due to their lack of backlight control). The direct dimming system also ensures that colours aren't as widely affected (bleached) by uncontrolled light as they are when watching HDR on an edge-lit TV. The XF9005 even introduces a brand new picture feature we haven't seen before on other Sony X1 Extreme TVs. Called X-Clarity Motion, it lets the TV insert black frames into the picture to improve perceived motion clarity without the usual accompanying major reduction in brightness. It does this by using the XF9005's local dimming light engine to drive bright parts of images harder, compensating for black frame insertion's darkening effect. As a result the XF9005 excels with its motion performance. The new system is a revelation, doing exactly as promised: making 24 frames a second footage look much crisper and less juddery, without brightness taking a serious hit with most of the TV's motion processing options. Thanks to a combination of this peerless motion performance and the Triluminos system's colour subtlety, the 65XF9005 does a gorgeous job of bringing out all the detailing and clarity you hope to see with native 4K sources on a big-screen 4K TV. It's not just a 4K Hero, though. That X1 Extreme processing also makes it exceptionally good at converting sub-4K sources to the screen's native 4K pixel count, adding heaps of detail while simultaneously stripping out source noise. Also noteworthy is the XF9005's system for converting standard dynamic range (SDR) content to HDR. This system is applied automatically to most of the TV's picture presets, and it does a superb job of expanding the picture colour and brightness range without making the picture look unnatural or gaudy. 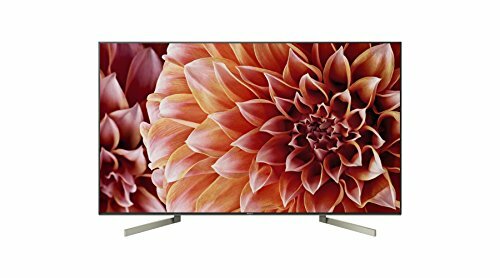 While the XF9005's pictures are for the vast majority of the time far superior to those both of its predecessor and other similarly priced TVs, they do have a couple of limitations. First, while its backlighting system delivers better black level response and smaller backlight clouding issues than any edge-lit rival, it's not entirely free of backlight distractions. Where a bright HDR object appears against a very dark backdrop, there can still be a circle of backlight clouding around the bright object that stretches as much as an inch or two beyond the object's edges. And this circle of extraneous light is actually slightly more intense than it was on last year's XE9005, due to the newer models' higher brightness. The other issue with the XF9005's pictures is that they don't hold up to viewing from much of an angle. Watch from more than 20-25 degrees off axis and colours lose saturation, while the backlight blooming around bright objects becomes far more obvious. Despite having seemingly chosen a minimal design over the inclusion of any visible speakers, the XF9005 doesn't sound bad at all. The soundstage has genuine scale, spreading away from the TV chassis both vertically and horizontally. Voices never become overwhelmed or misplaced, even at high volumes, and there's plenty of precision and clarity when it comes to rendering any subtle details a film soundtrack might contain. More bass when handling explosions and the like would have been nice, and occasionally a particularly shrill treble effect will sound thin enough to become harsh. Neither of these problems is as common or distracting, though, as they can be on typical mid-range TVs' soundsystems. The Sony XF9005 deserves to be every bit as successful as its predecessor. It improves on performance in multiple key areas, including, most notably, brightness, colour, HD upscaling and motion clarity. What's more, it does this without costing significantly more. There is a small price to pay for the brightness improvements in the form of some slightly more obvious backlight blooming around extremely bright HDR objects. But the good news far, far outweighs the bad. The baby model in Samsung's debut QLED range from 2017 is still widely available - and handily discounted, too. It only uses edge LED lighting, so doesn't deliver the rich black levels and extreme contrast you can get with the Sony. It is, though, stunningly designed, exceptionally bright and colourful, and uses an innovative new screen filter to soak up ambient light. All of which makes it almost uniquely fun to watch in a bright room environment. If you can find £500 more, you can bag yourself this entry level 65-inch model from LG's 2017 OLED TV range. Since it uses OLED technology, its black levels are stunningly deep and free from clouding, which in turn helps its colours usually look rich and intense despite it not being as measurably bright as Sony's LCD model. Even though it's the entry-level 2017 OLED, its picture quality is actually the same as LG's top-end OLED models.